« Return of George and ? This afternoon I badly needed a break from the unforgiving “landscape” of my computer. I had a choice – the snack machine or the garden? In deference to my new fitness routine, I sought the solace of the garden. The day felt more like spring than the middle of August. A soft breeze blew through the garden carrying on it the sweet fragrance of gardenia. I encountered a little boy in a bright red tee-shirt attended to by his doting grandparents. They were on the “hunt” for bleating frogs and colorful koi and were not disappointed. The little guy giggled with glee when a green frog jumped “kerplunk” into the water of the Reflecting Pool. They mentioned that this was their first visit to the garden. It brought be back to my first visit to the Winterthur Garden when my children (now 25 and 21) were young. It was the first day of 1st grade for my youngest and my first day with time on my hands. What freedom to walk through a splendid place without a time table or a box of animal crackers! I walked as far as I could, finding the quarry garden at the “end” of the garden. I sat on a hidden bench and enjoyed precious time to myself to think and to observe hummingbirds and butterflies. That was the day I fell in love with gardens – and this garden in particular. The laughter of children enjoying Enchanted Woods mixed with the music of cicadas brought me back to the present. The garden provided just the lift I needed. Better than dark chocolate? Not quite, but close! 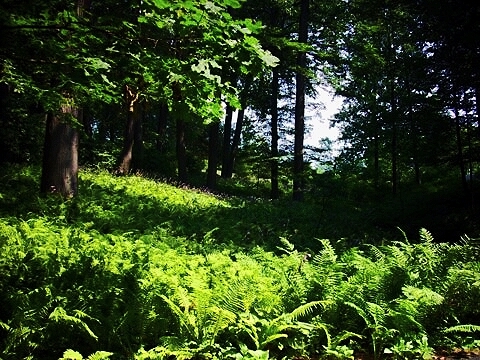 Come, find a paradise to soothe your soul and brighten your day at Winterthur this summer!